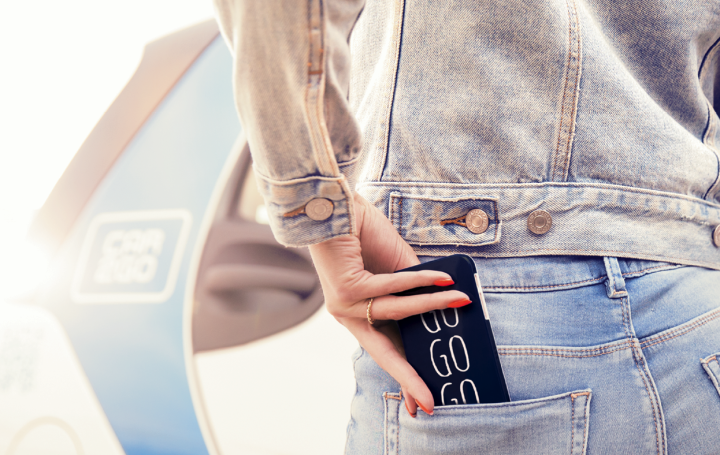 car2go is catering to the generation smartphone, an information, booking, and payment device in the entire mobility process through the new app. The entire rental process is progressing with one single device – the smartphone. The customer can find vehicles on the streets of any of our operating cities on the car2go app and on the website which are marked with a smartphone only icon. The smartphone based process spreads on and on and more and more cities will be equipped with the appropriate vehicles. For these vehicles, the entire rental process takes place exclusively via the car2go app. Without revealing too much: By using your smartphone the rental process is getting much easier, more convenient and faster for the customer. Whether the customer rents a car2go with the new technology, he recognizes on the one hand on the map on the website and app. By tipping or clicking on a vehicle, whose whole rental process takes place in the app, an orange smartphone icon appears next to the license plate. This symbol is also displayed in the list view. On the other hand all those vehicles are tagged with blue smartphone only stickers or “app opening” stickers on the windshield. What new features does the car2go app have for smartphone only vehicles? Already, the car2go can be rented and opened with the smartphone. And in the future you do not need the member card for that any longer. With the new vehicles, car2go goes one step further, because here the app is used as the central “key” before, during and after the rental. In the new vehicles with the smartphone only icon, the customer can carry out all steps of the rental process easily on his smartphone. For more information about the rental transaction with smartphone only have a look here. BlackBerry and Windows user have a reason to be happy: the app is also available for them. Worldwide this makes up around one third of all rental transactions. In which cities have you already tried the new app and smartphone only vehicles?